One of Europe's most under-threat butterflies has been discovered breeding on a site in Carmarthenshire. Marsh fritillary caterpillars have been found at the Butterfly Conservation (BC) Median Farm Nature Reserve at Cross Hands for the first time since the 1960s. 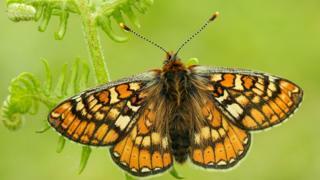 The marsh fritillary has declined by 71% across Wales in the past 30 years. They are found in north-west and south-west Wales, as well as parts of Ireland, Scotland and England. "We're absolutely thrilled to see how well the butterfly has responded to conservation work so far," George Tordoff, senior conservation officer for BC Wales, said. The wildlife charity said its conservation efforts, along with the warm summer, had encouraged the butterfly to spread to new areas. "We have been restoring the land at this site for the last five years thanks to help from project partners, volunteers, cows and ponies and we have worked particularly hard to increase the growth of devil's-bit scabious - the food plant of marsh fritillary caterpillars," Mr Tordoff said. "To see a new colony establish itself on restored land is great vindication of all that effort, although there is still a long way to go in making more of the reserve suitable for the marsh fritillary." The butterfly's yellow, orange and brown-coloured wings are more brightly patterned than those of other fritillaries, and its caterpillars spin webs that are easy to find in late summer. The land on the nature reserve where the new colony can be found is rented from Natural Resources Wales and its restoration has also been funded by Carmarthenshire County Council's award-winning Caeau Mynydd Mawr project.